Just a few weeks ago @Corona Canada had reached out to me asking if I would be down to work with them on one of their newest campaigns… Re: ‘Your Perfect Canadian Mountain Moment – Opportunity’. I can surely say the whole experience ended up being just that. Where I had the opportunity to spend a day with three close girlfriends on the ski slopes before wrapping up the day with an amazing apres experience around a fire! ‘Closer to the sun’ is a hash-tag/slogan Corona uses to promote their brand, as their intention is to radiate sunshine in the world. How they do this is by encouraging others to ‘Find their Beach’ – A place they can go to escape the ‘hustle and bustle’ of the world to reconnect with what matters most (and no I don’t just mean connecting with a good cold Corona). But to just lay back, unwind and enjoy the moment. I am sure all of you initially connect Corona with summer, hot weather, the ocean or a sandy beach. 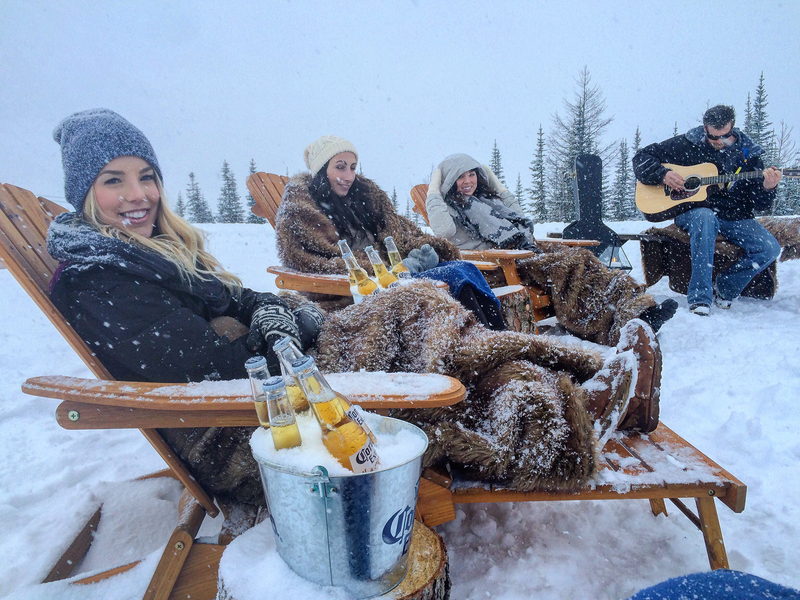 This year Corona has decided to take on a whole new outlook, bringing the brand to the snowy, wintery mountains… way above sea level! As different as the beach and the mountains are… they both represent the same things in a way. They offer feelings of freedom, vastness, opportunity and have a way of bringing people back from that ‘hustle and bustle’ I was speaking of earlier, where responsibilities and worries can be put aside for the time being. After a long day on the ski slopes, out in the backcountry snowshoeing/skiing, or whatever activity you may be participating in all day in the snow… there’s nothing quite like unwinding while watching the sunset, in a hot tub , around a fire etc. reminiscing about the day. ‘When the lifts close, horizons open’ is a way Corona likes to describe it. It’s all about those apres-moments. Three girlfriends and myself had the opportunity to hit the slopes at Nakiska Ski Resort in Kananaskis for a full day of skiing/boarding. The sun was shining, snow was great, the hills were quiet (given it was mid week) and laughs were frequent. Nothing like some quality girl time in the snow! Once the hills closed we headed for Fortress Mountain, where we gathered for an ‘après-ski’ experience, around a fire, completely encircled by mountain peaks. With smores and Coronas in hand, music, good company, mountain views, the sunset… We were able to unwind and take in the day. What more can a few girls ask for? It was an experience that will not be forgotten. We encourage all of you to find your own ‘beach’ in the mountains after a long day outside in the snow! Whether its with one friends or a huge group, there’s nothing quite like that quality time spent with amazing people in such an amazing place, providing us with those feelings of freedom and relaxation. A cold Corona tastes just as good during moments like these. What a great new take on an old summer favorite. I’d never think about “finding my beach” on a mountain, in the woods, or anywhere besides a literal beach really, but I think there’s something fun about this perspective! Glad you got to take part, and glad you shared the experience with us!